Heat oil in a large pot over medium heat. Place chicken in hot oil, season with salt and ground black pepper and cook until well-browned, about 5 minutes per side. Remove chicken and set aside. Add scallions, ginger, garlic, and jalapeno pepper to the pot; cook until soft, about 2 minutes. Pour water and rice into pot; bring to a boil, then lower heat to simmer. Cover the pot partially and cook for about 1 hour, stirring occasionally to prevent rice from sticking to the bottom. Stir chicken into soup and cover partially. 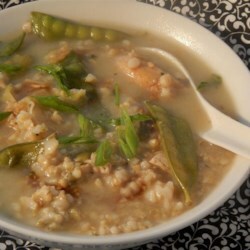 Continue to cook until the soup is creamy with a porridge-like consistency, stirring occasionally, about 1 hour. Remove chicken, pull meat from bones, and return meat to the pot. Stir in cabbage, snow peas, bean sprouts, soy sauce, and sesame oil; cook until vegetables are just tender, about 5 minutes. Garnish jook with cilantro.